On Monday evening I arrived in Cape Town to spend a few days with my kids and be here for my son Joseph’s 10th birthday. For the last two and a half years they have been living here with their mom and her new husband, so I only get to spend time a few days with them every five or six weeks. Each time I see them it is incredible to notice how quickly they are growing up, and because our time together is now so limited, I try to make the most out of every minute we spend together. Yesterday after I dropped them off at school, I decided to visit Robben Island, where former South Africa President, Nelson Mandela was kept as a political prisoner for 18 years. Robben Island is located about 7km from the shores of Cape Town and today it is a museum and UNESCO World Heritage Site. After our forty-minute ferry ride, we arrived at the island and were taken on guided bus tour. Our first stop was at the quarry where many of the apartheid prisoners were forced to work in the soaring heat and the blinding sunlight with inadequate equipment and clothing. The bus tour allowed us to see a substantial portion of the island and it give me a good idea of the harsh and dry environment that the prisoners had to contend with over the many years they spent there. Following the bus tour we were taken on a walking tour of the Maximum Security Prison, which was led by a former political prisoner who was locked up for 16 years on the island. He was only 19 years when his sentence began. 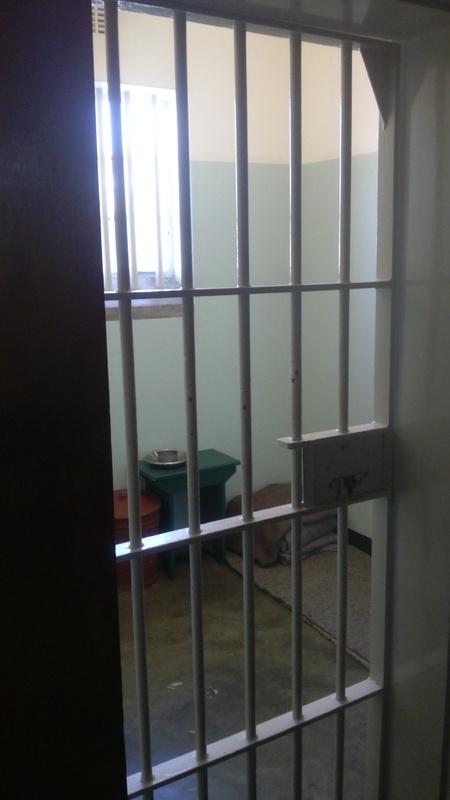 During our walking tour we were able to visit the many rooms, cells and courtyards that make up the prison, including Nelson Mandela’s cell. The cell itself is a tiny cement room of 2.5m x 2.5m with just a thin bed roll on the floor. I felt a lot of sadness as I stood there and looked into the cell through the iron bars and I found it very difficult to imagine how he was able to spend 18 years living in there. After about ten minutes of standing there and once everyone got their chance to take their pictures, our guide then showed us his own cell. To me, this was definitely the most emotional part of the tour and I felt extremely humbled to be in his presence. While standing there he told us about some of the conversations he had over the years with Nelson Mandela. One of the members of our tour then asked him how he has the strength to be a tour guide at the Robben Island Museum? He said that at first, the idea of returning to Robben Island was incomprehensible to him, but after many hours of deep thought and contemplation, he realized that going back would be part of his own healing. So he moved his family down to Cape Town from and became one of the guides, retelling the story of Robben Island, and telling his own personal story to thousands of visitors. On the ferry back to Cape Town, I started to think about what I had experienced during my visit there and what it made me realize is that I truly have so much to be grateful for every day. It also made me realize how much Ho’oponopono has helped me set my subconscious mind free from all the memories (errors and the data repeating) within it, which have always manifested in my life as replaying suffering and reoccurring problems. This whole experience has made me realize again how important it is for me to keep focused on my own Ho’oponopono cleaning and try not to engage with my conscious mind, so that I can give The Divinity an opportunity to erase the problem-causing errors and data in my subconscious mind to Zero. Because I know that during the moments that I am able to achieve that, out of the nothingness, I will once again be able to experience peace and receive inspiration from The Divine. I wish you peace and happiness beyond all conscious understanding. PS> Next week I will be launching my brand new Ho’oponopono Self Hypnosis audio, which I know you are going to love. So today I am doing something very cool. If you are one of the next 10 people who book a 30 minute Ho’oponopono cleaning Skype consultation, with me, you will receive a complimentary copy of the my brand new Ho’oponopono Self Hypnosis audio and all the bonuses, which have a combined value of over $100. Once you have made your booking, please email me your receipt, and we will arrange a time for us to meet. So make sure you act fast: It is only for the next 10 people.